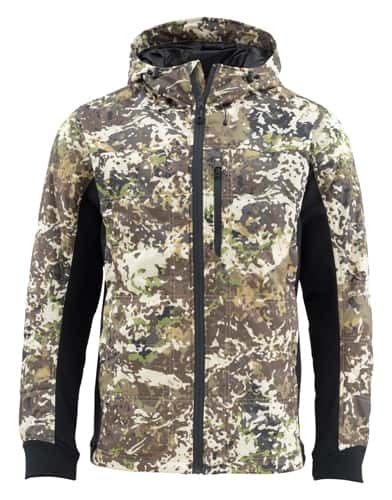 It's like kinetic energy with all the warmth with the Simms River Camo Camouflage Kinetic Jacket built with Primoloft Gold insulation. Simms has placed Polartec Wind Pro stretch-fleece—located in underarm and body panels—enhances breathability and increases range of motion for making casts that count. The Kinetic comes with brushed tricot-lined handwarmer and zippered chest pockets are low-profile and won’t catch lines. And a low-profile insulated hood, designed to layer perfectly under Storm Hoods featured on Simms shell pieces, adds fortress-like performance to your on-the-water arsenal.